This post brought to you by Microsoft. All opinions are 100% mine. A few weeks ago I was given the opportunity to test out a fun new feature on the Microsoft Office program. It's called OneNote and it enables you to create documents quickly and easily. My task was to use the OneNote program and its features to create a TripBook to see how beneficial it was for trip planning. The answer is: incredibly! If you're like me, you find cool things to do all the time and wish there was a place to put them, so you make a note on a Post-it or email it to yourself or print it out and then lose it 10 minutes later. Don't you hate that? Even with my travel organizational binder, I still end up losing more than what ends up in there, so it only really helps me plan for random trips I may or may not ever have or for organizing my current trips. Here's the coolness that is OneNote. I was asked to create a one-day itinerary for a trip to Melbourne, Australia. As in, what would I do - or tell other people to do - if we only had one day to explore the city. It can also be part of a full vacation. It actually took me longer to download the software than it did to learn how to use it and get started, but I had the added bonus of getting a video tutorial to get me going a bit faster. (There are demo videos available on the OneNote website as well.) The #1 best thing about OneNote is that it syncs to your internet, so you can surf the web and if you find something that you'd like to add to your trip plan, you can click on the "add to OneNote" and it will take the page info and add it to a Notes page for you to sort out and place in the document wherever you want it. There are some other pretty cool features, too. My favorite is the ‘click and type anywhere’ feature that allows you to type text anywhere on a page. If you don’t like where it is, click and drag it to another part of the page! No more time wasted on formatting paragraphs and margins. You can make the page exactly how you want it by just dragging photos and text and putting them in their perfect place. There are also easy formatting options for each box of text. For example: if you want a set of text to be in a colored box, just add color to the box and you’re good to go. It won’t color your whole page, unless you want it to. Do you plan trips with friends and family? With OneNote, everything is shared through the Windows Live site (whether they have OneNote or not), so you can share with whoever you like and give them editing permissions. This is great, too, because if everyone likes to do different things, each traveler can pull stuff they think sounds fun and add it to the OneNote and everyone sees it updated immediately. There’s also a funky handwriting option, so if you want to comment on something that someone posted for everyone else to see – and so they know it was you and it doesn’t blend in with the rest of the document – you can add a quick note you hand wrote saying you like it, too, or whatever else you want to write. Once everyone is finished brainstorming about the trip, you can take all the notes and internet “clips” and format them into your very own TripBook. Whether that includes full-page itineraries for each day or just a loose schedule for each day is up to you. Everyone will have had a hand in it and your trip will be totally customized! You can add other pages to your TripBook by utilizing the tabs up on top and renaming them anything you want. If you have a specific template you’ve used on a page and want to continue using it on all the other pages (say, for Day 1 itinerary through the other days of your trip, like I normally do) with an easy click of your mouse. Basically, OneNote allows you to be as structured or as freestyle as you want, lets you collect notes, info and pictures all in one place until you’re ready to make them into a usable document. Whether you choose to do it as you go or all at once, OneNote gives you the freedom to create the way it works best for you and helps you look good doing it, all while making it super easy to work with. 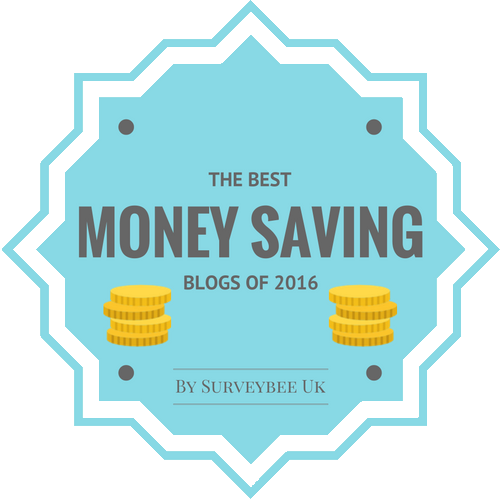 I loved it and will be using it for all my future travel planning. If you’re like me and do all the trip planning, then this is a fantastic organizational program for you and when you’re done, you can share it with your traveling companions, too. 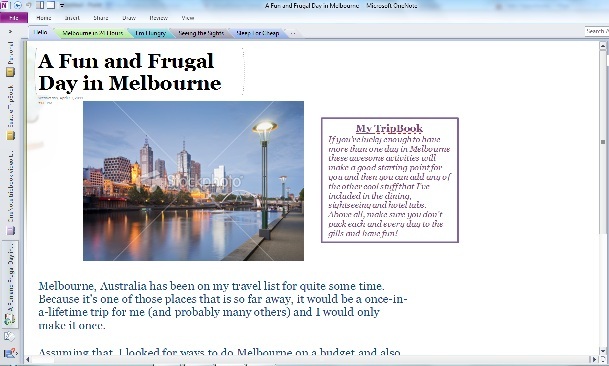 You can check out the 40 TripBooks on the OneNote TripBook website, including my Fun and Frugal Day in Melbourne TripBook that I created to give you a taste of things you should not miss on a trip to the city. My TripBook will be available on May 11, but in the meantime, you can see others that have gone up already. They can give you an idea of what you can create in a short amount of time, as bloggers were given just 48 hours to complete their 24-hour itinerary in the city they were assigned. So, not only will you get to see what can be accomplished in OneNote, but you’ll also learn about 40 different cities across the world to get you excited to start planning your next trip! I hope you find the software as useful as I do and start using it for your trip planning and anything else you might create a document for that requires organization and information gathering.